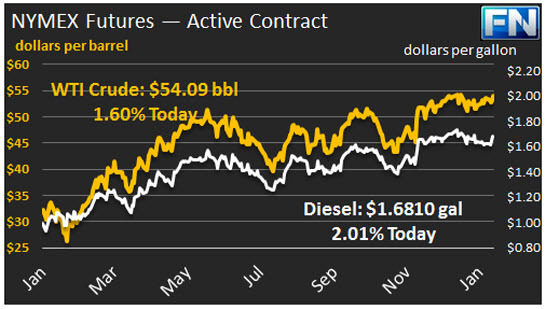 WTI prices have surpassed $54/b this morning, close to where prices opened one month ago on January 3rd. Yesterday, it appeared that WTI would settle back into the vicinity of $53.50/b, but prices spiked in this morning’s early trading. WTI opened at $53.57/b today, an increase of $0.81 from yesterday’s opening price. 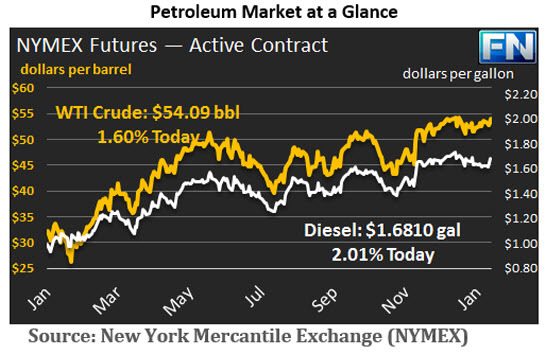 Current prices are $54.09/b, up $0.21 from yesterday’s close. Yesterday’s market faltered when the API released its survey data showing a major addition to oil inventories: 5.8 mmbbls of crude, 2.9 mmbbls of gasoline, and 2.3 mmbbls of distillate. The official release of EIA data yesterday showed an even larger build: 6.466 mmbbls crude, 3.866 mmbbls gasoline, and 1.568 mmbbls distillate. Distillate opened at $1.6709/gallon in today’s session. This was 4.02 cents above yesterday’s opening price. Current prices are $1.681/gallon, up 0.07 cents from yesterday’s close. RBOB opened at $1.5799/gallon today, a rise of 2.34 cents from yesterday’s opening. Prices are $1.5741/gallon currently, down 0.5 cents from yesterday’s close. A new source of crude is expected to enter the market this coming month: sales from the U.S. Strategic Petroleum Reserve (SPR.) The volume of crude in the SPR is now well above the volume required by U.S. participation in the International Energy Agency (IEA.) The EIA’s summary follows as our second article today.